Posters on online forums that claim examples of Thai honesty are fabricated were dealt a crushing blow yesterday in Pattaya. A Japanese tourist was video-ed giving his heartfelt appreciation to a minivan driver, the Department of Land Transport (DLT) and the Pattaya Tourist Police. Ryochi Mihashi, 46, had taken a minivan from the bus station in Rayong to South Pattaya. 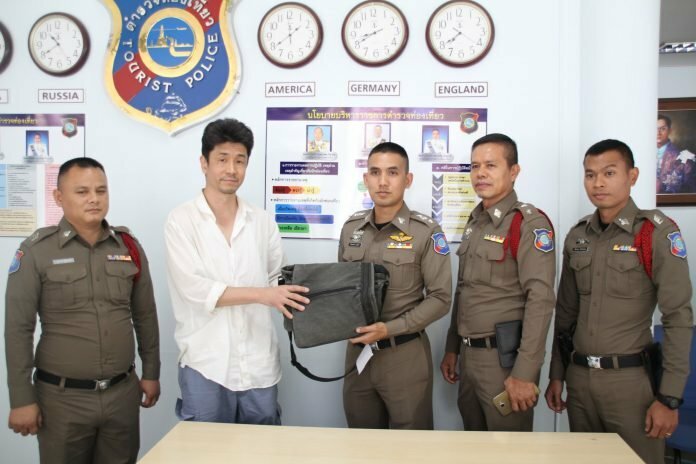 But he left his bag in the van - it contained 4,100 baht, US 440, 56,000 yen, a phone, a notebook and other items. The hero of the hour was driver Somchai Bunsiri who handed the bag into the DLT on Sunday. With help from the Japanese Embassy the DLT and the cops Mihashi-san was traced. A video showed him ensuring everything was in place - it WAS down to the very last baht. As a smiling Lt-Col Piyapong Ensarn, chief of the Pattaya Tourist police, looked on the delighted Japanese tourist confirmed that all was in order. Then in broken English he said a "very, very thank you" to the driver, the DLT and the police. Now, Thaivisa notes, the truth is finally out! When we are open to it many acts of kindness, generosity, and honesty are right there in the open. Happy for the Japanese visitor, he got back what was his. And grateful to the minivan driver for his honesty. Now, Thaivisa notes, the truth is finally out﻿! But but but.... this story has nothing to do with the bad stories about their driving, so thaivisa, the truth is hardly out at all. that said, it’s undeniably wrong to say that all taxi and minibus drivers are either dishonest or unsafe... it’s simply not true, but unfortunately it’s a damn site more than “one bad apple” that’s ruining the barrel. What truth is that, one van driver did the right thing expected of him! Good show and all that, better than the buses where somebody scavenges around in the luggage hold pilfering from bags! One extremely lucky Japanese ! This sort of Thai dishonesty has a long way to go before becoming honesty! They love to be portrayed as good old honest people don’t they ?! Totally full of it, you can judge it by the photo shoot, please grow up and act your age ! Why such a fuss? In most countries what happened here would simply be the norm, not the exception. Public transport driver hands in lost property to Police. Authorities track down the owner and return his property intact. This should not be news worthy. Guys, don't you think it's high time you stopped being so skeptical about all this recent honesty? OK, perhaps there are some minor issues we're not aware of, like perhaps the honest folk who return this money are compensated in some way, unknown to us farangs? Perhaps the word went out to taxi drivers that the powers that be in Thailand will ensure some type of wonderful benefits to these honest Thai folk? In any case, if it was my money or belongings that were lost, and returned to me, I for one, would be extremely grateful, how about you guys? As the saying goes, don't look a gift horse in the mouth, ok folks? My two cents, duly deposited. Now if only they could show you the video of the same asshat driver and his co-workers driving like complete cockwombles when they drive through Ban Chang on the way from Rayong to Pattaya that would be far more like reality! !